Processed by Robertson Optical's in-house digital surfacing. 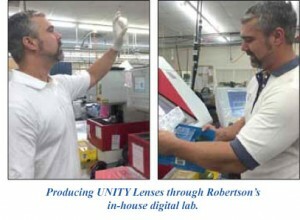 Robertson Optical Laboratories has become an official UNITY® Enabled laboratory, and is now processing Unity lenses through its in-house digital surfacing services. Customers have the ability to utilize the entire portfolio of UNITY lenses and performance coatings from all Robertson locations: Atlanta (Loganville), GA; Columbia, SC and Greenville, SC. Eye care professionals and patients can rely on UNITY’s advanced lens technology that allows wearers to experience all of life’s important moments, from the little ones to the big ones and everything in between. UNITY Progressive Lenses: With UNITY Progressive Lenses, patients are offered a variety of choices for ultimate customization and exceptional vision, including designs optimized for mobile device users. Single Vision Lenses: UNITY digital lenses provide the clarity that allows wearers to experience the details of life, along with obtaining the sharpest, clearest vision possible. UNITY digital single vision lenses offer three customized choices and the latest freeform processing technology to meet the needs of single vision wearers. Computer Vision/Lifestyle Lenses: These task-specific lenses help wearers perform successfully in daily activities and avoid unnecessary strain and frustration. UNITY computer vision lenses include a range of choices based on patients’ individual lifestyle needs, so they can focus on the important things in life. Performance Coatings: A range of lens enhancements including glare, scratch and smudge reduction, easier cleaning and UV protection. Photochromic: Sunsync® light-reactive lenses offer the ultimate in indoor and outdoor comfort and convenience. Polarized: The optimal sunglass lens, providing glare reduction for increased visual comfort and enhanced color definition. Blue Light Protection: Protection from damage caused by high-energy blue light emitted from digital devices, CFL and LED lighting, televisions and computer monitors. ECPs are able to increase their revenue with UNITY. Through UNITY Savings program, VSP providers can earn up to $27 on every order of UNITY progressive lenses and up to $17 on every order of digital UNITY single vision that will reflect on their EOP. Dispensing UNITY lenses also puts Robertson customers on the path to the VSP Global Premier Program that provides ECPs many valuable benefits. Robertson customers can visit www.pathtopremier.com to learn more. For questions on ordering UNITY through Robertson Optical, please contact a local Robertson representative. Robertson Optical Laboratories is an Authorized UNITY® Distributor. OLP News: Tribute to Robertson Optical Co-founder Calvin Robertson, Jr.
Robertson Optical Laboratories has been named ‘Top Lab’ numerous times! © 2015-2017 Robertson Optical Laboratories, Inc. All Rights Reserved.